Howdy Are you a beginner and worried about how to boost blog traffic like a professional blogger and engage an audience to get close to your blog post and increase visits to your blog. Then, First of all, you have to know what blogging is and why people are so passionate to write blog content. Actually, we found many bloggers, who write content for any reason, some of them are passionate to write about their self, about their personal experience with some specific topic, some of them write content. What they have learned and published their post to the public, some of them write their blog to provide a useful information to other entrepreneurs, who are looking to get useful information to start up. We find many types of the blogger, who defines their carrier as a blogger and earn passive income via working from their home office by providing useful information and review about a particular product or service. After understanding that what is blogging, it not means that writing content without any format and publishes it publicly and looks result to engage people in your blog post. It seems to vanish post, yes, if want to be a professional blogger you have to improve your writing skill. that how your blog content provide a information in the proper manner or it should be in H1, H2, H3 etc Heading, subheading and paragraph step by step. Always remember that your blog content is a king of your site, whenever you write your content always be sure that you have written a unique post. (Unique post does not mean that Wright different information from others) for the same niche. It means that don’t copy others post, write your post in your own wording style. That people can easily understand, what kind of information you have in your blog post. Here are 10 tactics to write a unique blog post and boost blog traffic like a professional blogger. While writing a unique blog post don’t distract with your topic. Know day many bloggers problem are they used multiple information and people avoid such blog. Title tag plays a most important role to boost your blog post and make it viral on the internet. Which show what you have different from others blogger content. 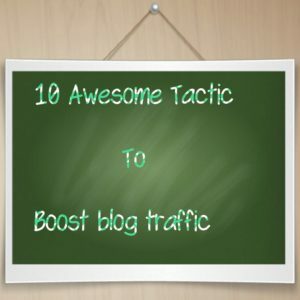 (10 way to boost your blog post or, 10 best SEO tools to make visible your blog post in the search engine) etc. Most of the user Attract visitor and boost blog traffic and get post viral, cause they use an attractive title. Which attract visitor to visit their blog? Your title must be related to your blog post, neglect using vanish post title. Meta Description also plays a major role to boost your blog post to go viral. When someone user searches any keywords on search engine below title tag. We saw some short note, blogger describing via providing an attractive short message about their blog. Theses short message is called a Meta description, where you have to give a description note about your blog post. Your Description should be not more than 150 characters, cause the search engine provide a meta description platform. Were you can openly give an attractive description to your user, actually what informative information you have in your blog content? Meta description provides the visitor a short note, where visitor easily understand what kind of information your blog belongs. The short description also plays a major role to acknowledgment visitor to visit your blog is readable to read. While writing a description always mentions your title keywords related to your blog content. Words of content to boost blog traffic. We have always heard that content is a king of your blog post, without content we can’t imagine to publish any blog post. To be a professional blogger, first of all, you have to know, how to write content with the best readability? Actually, when we saw professional blogger content, we find that they write content which is written in user-friendly behavior. So while writing content always use user-friendly words like (you, we, yours, them, they) etc. And intensive words like (cause, before, as well as, first of all, Furthermore, finally, so, due to, similarly) etc. Because such friendly words make your content easy to understand for visitor and built a user-friendly relationship. Always have passions to write long words content, cause its to make easy to rank your blog post on the search engine first-page result. 1500 plus words of content are more visible on the Search engine to optimize your blog post. Keyword placement is the best way to increase your visibility on the search engine to scroll down and index. Search engine doesn’t know what type of content you have nor don’t look after that how useful information you have. You can also say search engine have a blind purpose (Algorithm) where it found a way with using a thick stick (crawler). When it starts on his way via using a blind stick (start to crawl the blog) how many types of stone (keywords). Find on his way while kicking with his stick indexed it on his search console for listing. So keyword placement is most important to identify your blog to boost blog traffic. What type of keywords related information you have in your blog post to optimize in the search engine. Before publishing your blog content you have to place your keyword in a Title tag, Meta description, and inside each paragraph. To make a search engine to understand, what type of keyword related information your blog run. If you want to be a professional blogger and want to run your blog for a long time. Then your keyword selection related to your Niche Play most important role to get going your blog post day by day. While selecting your keyword to write a decent blog, first of all, you have to do some research to get perfect keyword? To get ranking your blog post on the search engine first-page result. There are many useful free tools (Google trend, keyword everywhere )etc and paid tools (Ahrefs, Buzzsumo, etc) to do research. And get useful keywords related to your Niche site. While doing research on keyword always use that keyword which has high volume, high CPC, and low competitor. High volume means that how many visitors visit monthly for a particular keyword on search engine. CPC means click per cost value of a particular keyword. And low competitor means that particular keyword doesn’t have too much information on the search engine. Image shows the purpose of your content .what type of Niche content you have on your blog. So, it is most important to identify your blog image to the search engine to crawl and index it to a listing. While adding an image in your blog post, you have to look after image size, image format, Alt tag, and image quality. Your image size should not be more than 95 kb or keep it below than 95 kb but don’t lose image quality. Always use jpeg format image because it doesn’t impact on your website downloading speed. PNG format image is also good to use, but it is a high-quality definition image, which has the large size to get a quality image. The most important part you have to look after while adding your image to your blog. You have to give an address with using Alt tag option to identify search engine to crawl your blog image. You can use your Title tag, blog post address link, or permalink to image Alt tag option and give a particular address to your image. Linking a popular blogger blog post URL in your blog, with giving a link on the specific topic. It makes your blog look automatically professional because whenever any visitor visits through that link to other blogger posts. Your blog increase high-level Authority visitor find much more information in one place and trust to your site. If you want to be a professional blogger you must have to do a smart research with finding popular blogger related to your niche. Because when any visitor visits your blog his/her purpose is to get more information in one place. So whenever you publish your blog always link some popular blogger blog post to your content. Link building of popular blogger blog post helps you to provide your visitor with extra information. And it makes your Audience to engage with your blog post and stay more time on your blog content. Writing a Unique content to boost blog traffic. Know days content is a king and have a great place on the internet if search any keyword on search engine. We find plenty of websites which provides information for a particular keyword. Therefore, if you want to stand on this huge internet world and want to find your website on the first-page result. You have to be prepared for writing a unique content, and it should be more than 1500 plus words. Yes, if you want to boost your blog and get high ranking on search engine, mostly you have to be ready to write long words content. Always use those words, which are simply known by people or words those are user-friendly. Avoid using irrelevant words, which don’t have any sense related to your content. Best way to write a unique post is to provide descriptive information and describe it how easy or simple you can. Doing Framework to boost blog traffic. Here framework means (how to build a strategy to write a professional content step by step). While writing content our first work should be Make a strategy that how your post would be written. Using a Heading, Subheading, paragraph, Making Bold or italic some particular words and providing a link for extra information. Well, we found many professional bloggers used a different tactic to write their content in proper manners. But they plan and used the same strategy, step by step providing information with using separate heading to increase their readability. Yes, readability is most important for any blogger to engage traffic on their blog post. We find plenty of websites provides content for the same keyword but only some of the website only seen on the search engine first-page result. Cause their content is too good but their readability is not user-friendly and that’s why visitor skips to another website. This is the last step and very important for the beginner, that why one should need to revise and look after the post preview? If, you are not a professional blogger and just started your carrier as a blogger or part-time blogger. Your last step should be, have a look to your post preview, cause while writing a content we leave some small mistake. A small mistake means, you forget using to bold or italic some important focus words. In the preview, you can see, how your blog post looks on the website for your Audience. Is your image has a great quality? For your Audience. Does your blog post look user-friendly? Means heading, subheading, paragraph, and permalink are in the proper manner. Once you clear that your blog post is looking suitable for an audience, and then you can publish your blog post. Preview and revision is the best way to improve your content publishing skill. While starting any type of project business, carrier. The most of the difficulties we face while startup. Blogging is not a onetime performance to get a positive result for your hard work. It welcomes with consistently hard work, with having a great passion, and with keeping patients as a result. Actually blogging is a worldwide organization on the internet, where each and every user is equal to find and learn something. With using a particular keyword research, related to product or services on the search engine. So as a blogger you have to provide genuine information to your audience consumer/customer to get their belief. Always be aware to write quality content not a quantity of content. Cause, if you have quality in your content Audience finds your site useful to search then another website. If you don’t have any quality of content then it is worthless that how many quantities of content you have on your website. How we can grow the relationship and increase the audience on your blog site? Avoid writing vanish blog post; understand your Audience need what kind of information they want from your blog. Are you worried about how to know you Audience need, it’s very simple. If your audience finds informative information from your blog, they will be in your touch with a good relationship. With using a conversation option, which you provide for the audience in your blog like comment box, email chatting and call to action etc. If you are engaged with the audience or getting comments via your Audience. Then you are obviously providing a great content for your audience, and they are looking more from your blog. Providing a platform, where the user can directly connect via using a call to action, email chatting, and comment box etc. Where your Audience gets a conversation with you and solves their queries, doubt and write a comment. Always be honest, while providing your blog post to your Audience be sure that your content is related to your Audience need. Blogging is not a one-time audience support; you have to attract your Audience via providing informative information regularly. Don’t provide vanish content to your Audience to maintain your blog quantity. Weekly 2 or 3 blog post is good and enough to engage with your Audience to increase traffic to your website. Always be faithful to your audience by replying to their comments on comment section box. Your conversation with your Audience makes your blog to look professional and trustable. If you are a beginner and just started your blog it will be not easy to engage Audience on your blog. You have to forget about the audience, just post quality content weekly 2 or 3 posts via 1500 plus words are good to get going your blog. Share and promote your blog content on social media with giving attractive short information, that what type of information you have in your blog. After 2 or 3 months later you find that visitor is visiting and you are increasing traffic on your blog site. Here I have shared a post that how you can write blog posts content like a professional blogger and boost blog traffic on your blog. I have mention 10 tactic and some useful information for a beginner, that how they can write a blog content that looks like a professional blogger. And some informative information on how to behave and built a relationship with your audience. And useful information to a beginner how they can start up and engage traffic on their blog site and boost blog traffic. Thank you very much for sharing such a wonderful information ….